I don’t know why I don’t go to La Fabrique more than I do. This place is amazing. I just remember the one and only time I went for dinner, I was completely blown away. Looking for somewhere to brunch, La Fabrique came up in my search and rose coloured memories gently came floating back. Without further ado, we made our way to the Annexe and promptly sat out on the terrasse out front overlooking the St. Louis square. It was a perfect, beautifully sunny day and the weather was just right for sitting outside. Snagging a spot half in the sun and half in the shade, we waited patiently and expectantly for the good eats to come. 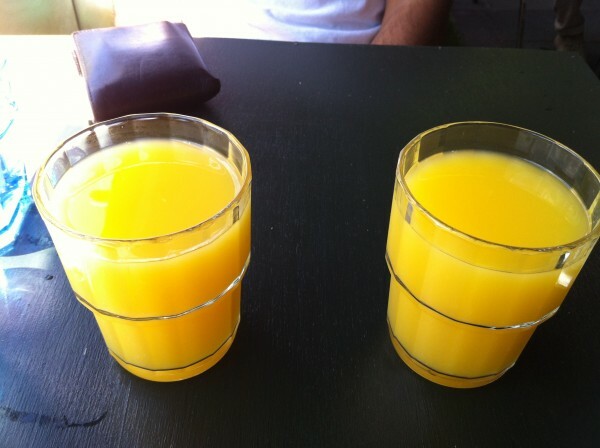 Starting with two glasses of freshly squeezed orange juice, we made our choices. I had the pain perdu with a lightly infused fleur de sel cream and chopped pineapples while my friend ordered the toast with poached eggs and braised pork. I’ve always vacillated between ordering sweet and salty dishes for breakfast, previously leaning towards the former and as of late, the latter. I guess the it depends on how the mood strikes me. 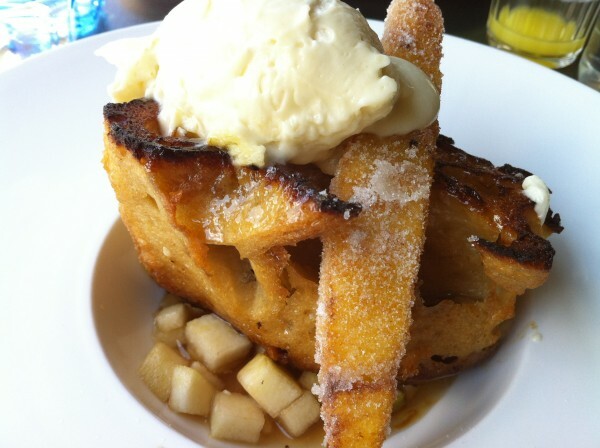 While scanning the menu, the pain perdu really popped up from the menu at me and sounded too good not to try and thankfully, I wasn’t wrong. A hunk of egg soaked bread came forth with a sugared and fried slice of pineapple and a generous dollop of cream, all on top of a small bed of chopped pineapples. Superior to the more well-known French toast, the pain perdu basks in a thicker, custardy batter that allows it to have such a fluffy texture. Piling on a little bit of everything into one bite yielded creamy, oh-so-delicous goodness that I haven’t had elsewhere in a long, long time. The toast on the other hand was reported to be equally delicious. I myself was only allowed a small bite. Looking deceivingly small, the lopsided stack of braised pork, apricot jam and poached eggs were a good mix of crunchy, salty, runny and sweet. Paired with the homemade fries and ketchup, these were enough to keep you full until past dinnertime. I’m going back next weekend. See you there! *For more photos of the space, check out our previous post on La Fabrique. 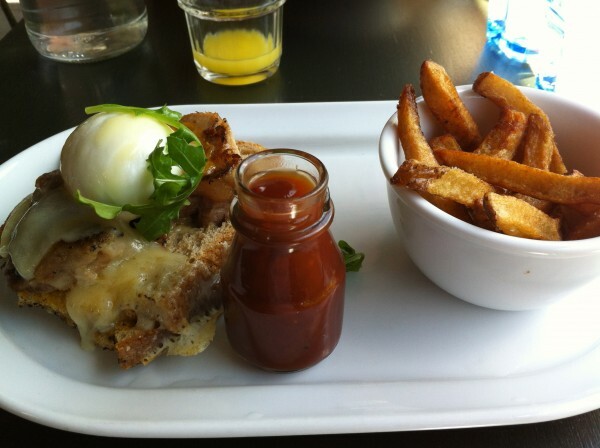 Tags: Apricot Jam, Braised Pork, Brunch, Cheese, Cream, Fleur de Sel, forkandtell, Fries, Homemade, Ketchup, La Fabrique, Montreal, Pain Perdu, Pineapple, Poached Eggs, St. Denis, Terrasse, Toast.